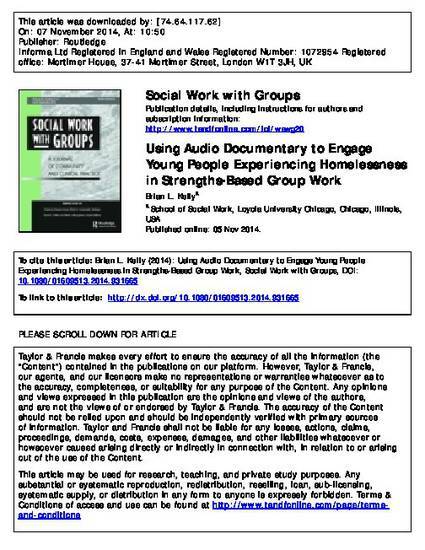 Little information exists on the use of audio-based activities in groups as a means to engage young people’s strengths. This article presents findings from a study that employed a coconstructed audio documentary group to explore homeless youths’ experiences in a music studio, their attached meaning, and whether studio and group involvement engaged youths’ strengths. Four young people and the author met over the course of 12 sessions to collaboratively develop, record, and produce an audio documentary. Young people successfully produced a coconstructed audio documentary and their involvement in the studio and the group engaged their strengths.